The Abbot Group is the largest offshore drilling contractor in the North Sea, one of the largest international land drilling contractors outside the Americas, operator of mobile offshore drilling units and a world leader in drilling rig design, construction and operation. Executive Chairman Alasdair Locke has transformed and focussed the company to this end since 2001. The happy result is that the group has hit a sweet spot and operates in an environment of high demand for its services. Its sector, notwithstanding the crude-price weakness of the last week, is likely to benefit from that demand for at least the medium term (say 5 years). Even the political outlook is favourable given the probability of Labour losing the next election: a Tory government may lead to an end of the opaque and arbitrary 'super' taxes on North Sea energy operations which Messers Blair and Brown have imposed when the spirit moved them. That would increase exploration and production activity - and demand for Abbot's expertise - further. Further, with M&A mania well underway generally, interest from larger suitors (Halliburton, for example) is not unimaginable. Yet Abbot's transformation is having a cost. Key ratios have declined year-over-year since 2003 and look set to again for the full year 2006. The assumptions used for 2006 are that the balance sheet remains as per the interims; full year sales match the 2005 interim vs 12 month split; and that full year EBIT matches the 2005 run rate, plus 10%. Any result over 2.9 is safe; results between 1.23 and 2.9 suggest caution. The conclusion is that Abbot is a leveraged bet with a vastly expanded asset base (particularly over the last two years) but thus far the productive sales and profitability generation of that asset base is unproven. 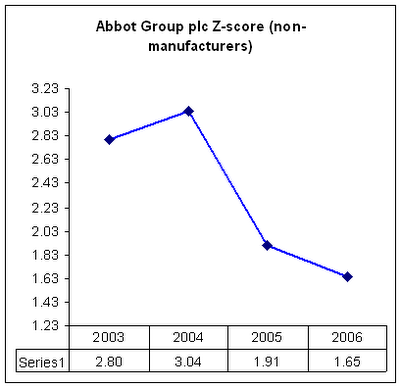 Abbot's expansion logic is impeccable and aggressive buyers of the shares will be counting on Mr Locke and team sweating the acquisitions more than has been the case. More finicky onlookers, despite fantastic macro conditions and 2007 forecasts, may want to see actual parallel gains in internal excellence before committing. So which are you, Sir? Aggressive or finicky? Hi Paul. Leaning finicky despite rising tide of the sector. At least one better place I can think of to put the cash. No, not iSoft. Or FuturaGene for that matter, despite interesting price movements last week - just how much influence do you wield?